Will the latest Indian nomination Lagaan appeal to the Oscar jury and clinch the award, asks V. Gangadhar, while maintaining that the western world has traditionally ignored Indian films, particularly those from Bollywood. WE are now in the thick of the ‘Silly season’. Or call it the ‘Awards season’. Leading screen personalities, keenly anticipating to be rewarded are rehearsing acceptance speeches, thanking their producers, directors, co-stars, parents, lovers, children and finally God! The Emmy and Golden Globe awards ceremonies are over.The Oscar—The mother of all movie awards—is all ready to take off. Hollywood puts on a real show for the Oscar night and we can now watch it live on the television screens. I don’t know if enterprising gamblers bet on the favourites for the awards. It could be lucrative because quite often, the underdogs walk away with some of the most prestigious awards. The Oscars may be legendary but even in the USA there are complaints that they are not entirely fair and are tinged with political prejudices. Actors who leaned towards the Right and went along with the USA on its foreign adventures were often favoured over the alleged Left wing sympathisers and liberals. That old ‘toughie’, John Wayne, was no great actor, but his rabble-rousing variety of patriotism and unstinting support to the Vietnam war fetched him the best Oscar Award for True Grit. Wayne was always the tough-talking, straight-shooting cowboy who had no sympathy for Red Indians and believed in going for his gun whenever he came across them. Not for him, the sympathetic attitude of liberals like Marlon Brando, who once refused to attend and accept the Oscar for the best actor because he protested against the government’s policies towards the Red Indians. Indian interest in the Oscar Awards has always been keen. After all, our Bollywood produces more films per year than Hollywood (764 in 1999 as against 628). But penetrating the western markets has not been easy. From the 1950s onwards, Indian films found better appreciation in the Soviet Union and eastern Europe, with Raj Kapoor’s Awara and Bimal Roy’s Do Bigha Zamin becoming all-time hits. Along with Raj and Nargis, the rest of the Soviet Union hummed the delectable tune, "Awara hoon." I guess Hollywood did not try to understand Indian films, particularly those from Bombay. They were intrigued by some of the Indian stars like Nimmi who claimed in an off-hand remark that she had never been kissed! Well, such a statement made headlines in the American Press which projected Nimmi as the ‘star who had never been kissed!’ Hollywood considered Indian actors on a par with Sabu, who became famous as the ‘Elephant Boy’. The fantasy element, the song and dance sequences of Indian films, somehow or other, did not enthuse Hollywood. Perhaps, that was why very few Hindi films made their mark in the West. Unlike the USA, Europe had a place for the cinema of realism, and it was no surprise that Europe recognised the genius of Satyajit Ray, whose films were totally different from the Indian commercial cinema. Even Hollywood could not avoid admiring Ray and conferred on him an ‘honorary Oscar’. The American media, to a great extent, ignored the Hindi film industry. Time magazine once carried a cover story on Parveen Babi, who they had mistakenly identified as the more popular Zeenat Aman! The occasional cover stories or detailed write-ups in the entertainment sections of the Asian editions of Time and Newsweek focused more on films made in China, Japan and South-East Asia. Perhaps more Chinese films were released in the USA which had a large Chinese population. However, with the increasing numbers of NRIs and their financial clout, the popularity of Hindi cinema in the USA and Europe shot up. So much so that today enterprising producers rake in more money from selling their films abroad and also from the sale of music cassettes. Even the latest multi-starrer, Kabhi Khushi Kabhi Gham, was termed a blockbuster only because it ran to packed houses abroad. One need not wonder why only two Hindi films, Mother India and Salaam Bombay, have so far been nominated in the best foreign film category. Didn’t the western audiences appreciate the gloss and splendour of Mughal-e-Azam, the man vs machine theme in Naya Daur, the youthful charm of Aradhana or the death-be-not-proud message of Anand? For one, these films were not marketed properly abroad. Or perhaps, they were too ‘Indian’ and lacked the universal touch, which Hollywood perhaps demanded for its Oscar categories. Did the latest Indian nomination Lagaan possess these qualities? Are moviemakers all over still interested in the exploited vs the exploiter theme? Don’t forget that cricket, a game played in less than 10 nations and which is practically unknown in the USA, is the main theme of Lagaan. Will it appeal to the Oscar jury who are more accustomed to the baseball world series where the US president ‘pitched’ the first ball? We can only wait and watch. In the meantime, there is general euphoria in the country over the honour accorded to Lagaan. If the Oscar comes to India, we can expect the usual frenzy with demands for a national holiday, a Bharat Ratna for Aamir Khan and the status of a ‘national film’ for Lagaan. The state governments will announce huge cash prizes, flats and other benefits to the protagonists of the film. The private sector will not lag behind with ‘Coke’ and ‘Pepsi’ offering the world to Aamir Khan to endorse their products. Lagaan has made over $ 2 million in the USA and the UK. The film won the audience appreciation award at the Locarno Film Festival and the Leeds Film Festival. It is the third film in the history of Indian cinema to make it to the Oscars after Mother India and Salaam Bombay. The other films nominated in the Best Foreign Film category are Amelie from France, Elling from Norway, No Man's Land from Bosnia and Son of the Bride from Argentina. Yet discerning movie-goers in India are not so much enthused over the Oscar hoopla and argue that in the case of Lagaan, the nomination has been made rather grudgingly and the film has been made the beneficiary of limited praise. Thus while Life is Beautiful (1998) received seven Oscar nominations and Crouching Tiger, Hidden Dragon (2001) got a record number of 10, Lagaan had to be content with just one. The first two films ended up winning a number of Oscars. Perhaps, Hollywood still regards India a poor cousin because it contributes just two per cent to the annual earnings of Hollywood. The blockbuster Hollywood film, Titanic, was a major box-office hit in India, grossing the highest for a foreign film. Yet its revenue, $ 2.5 million, was a drop in the ocean as compared to the $1.2 billion earned in the rest of the world, excluding the USA. Titanic’s overall earnings were a staggering $1235 million, while the highest-ever earnings by an Indian film have been just $14 million by Hum Apke Hain Kaun? The poor cousin has had to be content with just one nomination! Lagaan’s rivals have already won critical acclaim in the USA and the West. Unlike the Indian film, they deal with themes which are more popular in the West. Amelie, by French producer Jean Pierre Jeunet, is about a French girl who sets out to change the lives of those around her. No Man’s Land from Bosnia, a war-ravaged nation, has an anti-war theme which has permanent appeal to the West which was involved in the civil war in Bosnia. Both Elling (Norway) and Son of the Bride are human-interest films that deal with the impact of serious illnesses on families. Unlike India, the smaller nations of Europe and Latin America have made their mark on the Oscar scene. On March 24, we shall know if India can emulate them. LAGAAN has made it to the final five in the Oscar Best Foreign Film category. The Lagaan team, which had gathered at the Aamir Khan's Pali Hill residence since 2 pm on February 12, was overjoyed to watch the news on television late that evening. Soon enthusiastic cheers filled the air and crackers burst sky-high, echoing the feelings of those at Aamir Khan's residence. While the entire cricket team was singing and dancing to the tune of Sach aur sahas hai jiske man mein, anth mein jeet usi ki rahe, director Ashutosh Gowarikar and producer-actor Aamir Khan were attending endless congratulation calls and interviews. The jubilant Aamir Khan remarked, "This is more than thrilling. Getting nominated by a panel of 600 judges is no joke. Hope we win." Gowarikar, who got written off from all the producers' good books after dishing out two flops, seemed to be in the seventh heaven. "We did it, we did it!" screamed the overjoyed director. "This is an achievement about which the whole nation will be proud," he continued in the same breath. Vallabh Vyas, who essayed the role of Ishwar kaka, called it a "sixer"; Dayashankar Pandey, who played Goli, said the feeling of elation experienced by the team was ten times stronger than what they felt when they saw India winning the World Cup. The other Lagaanites, as they choose to call themselves, echoed Vyas' feelings. Declared Raj Zutshi, who played Ismail, "I am so happy. This night to me is a never-ending night!" Gracy Singh rushed to meet Aamir the moment she heard the news, and the team danced till the wee hours of the morning. Remarked Gracy, "It is a moment that I have prayed for, It is a dream come true." After receiving the news of the nomination, Khan along with his US-based publicist Madhu Kapoor decided to carry out the second part of the promotion plan (at an estimated Rs 5 crore), which included enticing the 6000-strong jury to actually go out and see the film. "We want everyone to see the film. Once that is done, the rest will be done by Lagaan," averred a positive Khan. Gowarikar's contention is that Lagaan would not be shortened, as it would lose its value. "The audiences are sure to love it as it is. The essence of the film is its Indianness that can come out only if the film is viewed in its entirety." Mahesh Manjrekar, director. Lagaan is an extraordinary movie. I like this movie very much. Every aspect of the film is complete. There are so many elements — romance, action, suspense and melody. The film talks of patriotism and togetherness. I am sure it will win. Subhash Ghai, director. Lagaan is very good. It, in fact, signifies a beginning where Indian movies are not only shown on Indian screen, but at an international level. 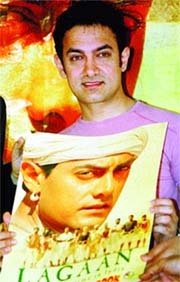 Lagaan is now reaching out to the many Indians and Asians, and also to different communities and to the Oscars. The entire film industry is very happy with this film being nominated for the Oscars. This movie has made our entire country proud. I had seen this movie before it was released and I liked the movie so much that I sent a letter to Aamir Khan and Ashutosh, congratulating them. It is a complete movie. Jackie Shroff, actor. It a fantastic movie. We should all take it as an example and work in only one movie at a time and concentrate on achieving good results. I have not seen this movie because I am not a movie-buff, but now I am certainly going to watch this movie. I am very proud that Indian cinema is now being recognised worldwide. Karan Johar, director. The film is outstanding. It has made us all proud by making it to the Oscar nominations. I would term it a masterpiece. I enjoyed watching it twice. It has brought us on the map of world cinema. It has made us proud and proved that India has the art of making good cinema. Feroze Khan, actor turned director. It is exhilarating. It is a good movie. I congratulate Aamir for the confidence he had in making that film. I watched the film in Sun City in South Africa during its premiere. There are very few actors like Aamir Khan who select a movie at a time.